Rabbit Stew: Hunting Rabbits is difficult! Yesterday I set out about four-thirty, about an hour and three-quarters before dusk. Rabbits - as far as I know - don't seem to emerge in numbers before dusk so going out early was more for the pleasure of being outside and walking around in the fields than anything else. I chose one sheltered spot at the base of a tree in the hopes that the view into the next field would yield early rabbits and that the neighbouring trees would be places where wood pigeons might roost. I sat there for a little while but soon saw that my view of the trees and the field was actually rather cramped - so I set off again. I sat under another tree with a view through a hedge across another field. At once two rabbits emerged and began to hop along the line of the fence fifty yards away across the field. This was too far for a shot so I watched them through the scope instead (and took a picture - whose blurriness is not due to the scope optics, but to the difficulty of focusing a camera with one hand whilst holding and pointing an 11lb rifle with the other). After a while, one of the rabbits stopped nibbling grass and ran - to my surprise - straight across the field towards me before ducking through the hedge and emerging about fifteen yards away from me on my left. 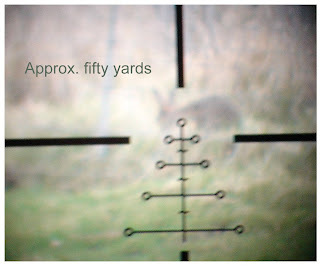 Green jeans, I decided, a camouflage jacket, an olive-drab baseball cap and a mottled-green scarf round my face must have concealed me very well, but this rabbit was now so close that it seemed to me impossible to turn and point my rifle at it without making it aware that I was sitting there. I began to move as slowly as I possibly could - but it was no good, the rabbit fled. I walked across the field to the fence where I'd seen the rabbits and lay down beside it, looking along the line of the wire down the field. My approach had startled them into hiding but fifteen minutes later the commotion of my arrival had faded enough to allow one rabbit to pop out in front of me at - again - fifteen yards. This rabbit seemed much more interested in eating than it was in me so I could take some time to steady the shot and try and gauge an aim point. My scope - a Hawke SR6 Nite Eye - is calibrated to offer .22 calibre air rifle aim points at between 20 and 60 yards -but at fifteen yards I was forced to guess the position - relative to the 30-yard zero - that my pellet would be in its arc. So I chose a point just above the twenty-yard mark in the scope and squeezed off a head shot. This missed completely and the rabbit - utterly unharmed - tore back to its burrow. I pondered this for a bit as the light died: perhaps my scope has drifted in the last week - maybe I needed to go and make sure that it was still zeroed correctly? More likely, it was just that I'd judged the distance or the aim point wrongly - or wobbled or failed to follow through. Dispirited, I got up and walked down the fence about a hundred yards and then lay down again. There's a distant street lamp that throws some light over this corner of the field and, as dusk became dark, I waited for it to turn on - only yesterday it didn't come on at all. Thoroughly miserable by then, I lay there in the dark for a while before getting up and trudging home for a (vegetarian) supper. Good read, maybe you should have thrown your gun at it from 15 yards, ;-) better luck next time. That's a very good idea - far better than looking down a damn scope at that distance! good read fella, looking forward to the next on. Hubert, as you're an avid Internet user and an SR6 owner too, I thought I should point you in the direction of the Hawke Ballistic Reticule Calculator (BRC). Register with them and they'll send you a link to download the software - it is fantastic. With my SR6 zeroed at 25 yards, a 13 yard shot would be at the cross below the centre cross. Your right its not easy! If you wana know more why not check out my website all about hunting them?